We shared our NYE with Toiny Westberry from theStudio. It was fun, it was festive and a bit wild at times. Exactly what a wonderful New Year’s Eve should be. I hope to get a page scrapped soon but I didn’t want to wait on my mojo because The Midnight Hour is still on sale AND I have another freebie that coordinates beautifully (in case you’re waiting on some mojo too). I truly love this kit. Diane and I were specifically thinking of a kit for New Year’s Eve when we created it but I think it has the potential to dress up photos from any occasion. Since it’s the NYE photos that most of us have in our camera and the NYE stories that are most fresh in our mind I wanted to share this lovely page border today. I’m looking for inspiration for next year. It’s one of my resolutions to start earlier and bring you more of what you need to scrap your memories. I would love to hear about your NYE celebrations and if you have special requests for a new NYE kit be sure to give me as many details as possible. 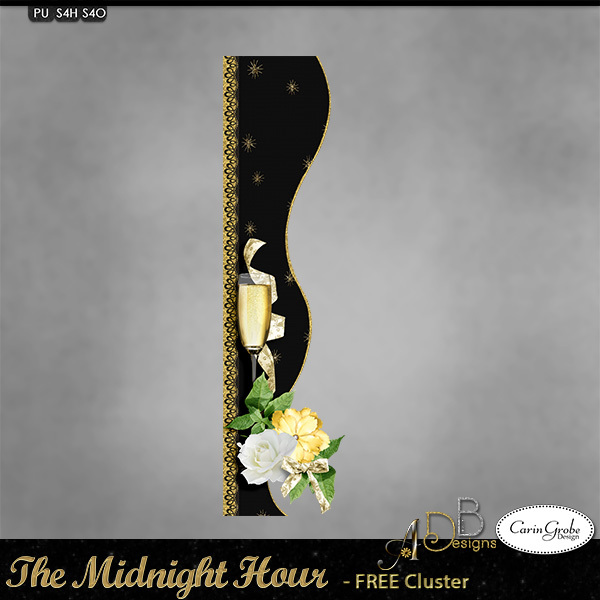 The Midnight Hour with ADB-Designs is in sale this week for 50% off. And come back before the sale ends. I’ll have at least one more freebie for you. Thank you!! This will brighten any page, but it will be wonderful with the bundle, which I bought.